There are many opportunities to continue your military service as an Active Guard Reservist. AGRs Active Guard Reserve (AGR) Soldiers serve in the military reserves but are full-time and have the same benefits as Active Duty Soldiers. The AGR refers to the military program of the Army and Air Force which places Army National Guard and Army Reserve soldiers and Air National Guard and Air Force Reserve airmen on federal active duty as needed to fill critical billets for at least 180 days or more. 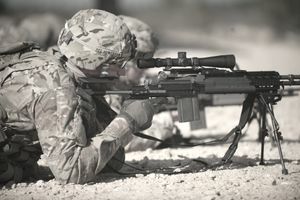 But a recall to active duty can also be by choice and for a variety of jobs such as the following: Recruiting, Public Affairs, Transportation, Quartermaster, Chemical, Military Police, Signal, Retention, Logistics, Judge Advocate General, Military Intelligence, Ordnance, Civil Affairs, Aviation, and many other career fields. Since 9-11, there has been an increase in AGR billets as a result of ongoing efforts to add more full-time support to Army Reserve units. About another 975 positions will also become available during this fiscal year through normal attrition, according to officials at the Army Reserve Active Duty Management Directorate in St. Louis. Recent numbers have the Army Reserve force at about 200,000 and the AGR is as high as 20,000 full-time or deployed Reservists / National Guard. "The AGR program is absolutely vital to the training and readiness of our units," said the chief of the Army Reserve, Lt. Gen. James R. Helmly. "AGR Soldiers are now deployed in Afghanistan, Iraq, and around the world as an essential part of our Army, enabling mission accomplishment and executing important missions on behalf of the nation. "We will continue to grow the AGR program with the required skills necessary to transform the Army Reserve while at war, enabling a greater level of readiness, agility, and responsiveness," he said. "We need the best and brightest as AGR Soldiers and I encourage all who are interested to apply and join the ranks of our AGR Soldiers." AGR Soldiers serve in full-time, active-duty positions in worldwide locations. They provide day-to-day operational support needed to ensure Army Reserve units are ready to mobilize when needed. The program, begun in 1979, provides AGR Soldiers with the same benefits as their counterparts in the active Army. This includes active-duty pay and allowances, medical care, commissary and PX privileges, and full retirement after 20 years of active federal service. In addition to a wide range of assignment locations, the AGR program also offers officers, warrant officers, and enlisted Soldiers the opportunity to serve in a variety of fields including transportation, human resources, military intelligence, finance, medical service and recruiting. discharged the Army, Army Reserve or Army National Guard. at least 18 to 54 years old. in ranks SPC through MSG/1SG. have accrued less than 15 years of active federal service. be eligible for reenlistment or extension. meet the medical fitness standards for retention prior to entry. pass a Defense Central Investigative Index. You must not have been relieved from any duty assignment for cause in the 36 months prior to your application and you must not have been involuntarily removed from Active Duty. be pending discharge from the Army, Army Reserve or Army National Guard. be a 2LT through MAJ.
be a W01 through CW4. have completed the Officer Basic Course, if you have served less than five years in rank. have completed the Captain’s Career Course, if you have served more than five years in rank. have accrued less than 15 years of active federal service (waivers possible). meet medical fitness standards for retention prior to entry. NOT have received a referred Officer Evaluation Report in the 12-month period prior to the date of application or entry. AGR Soldiers receive the same full-time pay and benefits as Army Active Duty Soldiers, including medical and dental benefits, commissary/PX access, full retirement after 20 years of active federal service, education and tuition assistance and other programs administered through the Department of Veterans Affairs. You can also be stationed in a large variety of training locations (over 6,000), with three years on-station (current average for tour stability), and offer the same promotional and training opportunities at Active Duty Army Schools (Airborne, Air Assault, Ranger, Special Forces, etc). The AGR program is open to Soldiers who serve in the Army Reserve, the Army National Guard, and the active Army. If you'd like to apply for the AGR program call Officer Applicants 1-502-613-6365 and for Enlisted applicants call 1-502-613-5927.